Conventional sulfuric acid anodizing is most useful for making aluminum parts more attractive and more corrosion resistant. The natural appearance of the aluminum oxide film is nearly transparent, and left as-is it is known as clear anodizing. This coating makes the parts more durable, corrosion resistant, and attractive, while still leaving them with a look that says "aluminum". This is the most economical form of anodizing. While clear anodizing is very useful, this coating can be colored to further enhance the appearance. 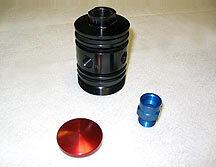 In addition to clear anodizing, Harcoatings Inc. also offers black, gold, blue, and red anodizing. Color anodizing can make your products much more appealing, and is also very useful for color-coding parts that look very similar but may have different uses or dimensions. 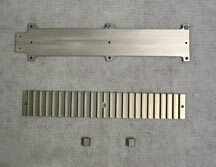 Conventional anodizing is typically between 0.0002" and 0.0008", depending on the application.